It’s easy to take tourist attractions for granted when you live in London – a city overflowing with them. 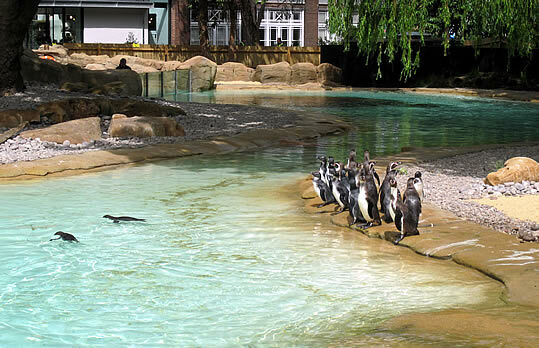 But ZSL London Zoo has so much to offer visitors in terms of both entertainment and education, that it could easily occupy the number one spot on a list of hundreds. Which, is why ZSL London Zoo won the coveted ‘Best Tourism Experience’ award at the BT Visit London Awards 2010 and, also achieved Gold in the Green via the Green Tourism Business Scheme, pointing up yet another reason to support ZSL London Zoo... Its’ prime location, in the Outer Circle of lovely Regent’s Park is yet another plus. When planning our visit, we took into account that non-school holiday weekdays might offer the best opportunity for lingering near the zoo’s most popular draws: gorillas, big cats, penguins, etc. But with 16,000 animals spanning 750 species in residence, one could go on and on! We were also interested in taking in some of the many shows and feedings occurring during the course of each day, so there was much to see. Where to start? The free maps near the gate offered plenty of options. Given the fact that we arrived as lunch hour was approaching and the day was prone to sudden bursts of rain, we decided to begin with a fortifying break at the Oasis Café, just inside the main gate, after which we were well prepared to begin our ZSL journey. Given the mythology, films and animations surrounding them and, their downright cuteness, penguins are a perpetual zoo draw, and are sure to be even more so in their recently opened multi-view home, Penguin Beach. From the way the resident Macaroni and Humboldt penguins were merrily scooting through the water there, I’d say it’s appreciated! The humans watching seemed equally rapt, as the clear sides of the penguins’ swimming pool, three times bigger than the old one and the largest in England, allows everyone from toddlers to the tallest of onlookers to get a close look at the penguins’ swift gliding and rapid diving. Made primarily of natural materials like wood and stone, with an ample decked seating area, the ‘Beach’ mimics environments familiar to penguins and people alike. Watching the penguins being fed later on was another treat as they played an impromptu game of catch the fish, before swimming off to savour their treasures. Both Macaroni and Humboldt penguins are vulnerable, meaning their numbers have diminished enough in recent years, due to climate change, to cause alarm. Bouncy castle looking Butterfly Paradise was our next stop, and as I’d never been to such a place before, and I am a butterfly-aholic, I was overwhelmed when I opened the door! Butterflies of nearly every description: small, large, transparent, dark, light, patterned, solid coloured, irresdecent, dotted, flew freely all around us, some hovering near hands, hair, or the odd flowered blouse or bag, before silently flying past, over and around us. Intriguing facts to be learned here abound, i.e. that butterflies can taste with their feet! Bright red hibiscus flowers were a particularly irresistible butterfly draw, as were other vivid flowers in this humid house. 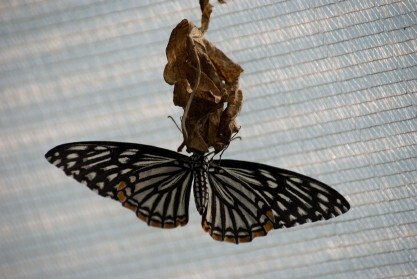 A zoo worker told us that some butterflies only live for a week, while others last through three. Their ever-shifting beauty created such magic, that I didn’t even mind when the heavens opened up and we were trapped there for a time. The sound of pattering rain intermingled with Indonesian gamelan background music only added to the experience. Favourites from the vast flying array included the wonderfully named Tree Nymph butterfly from Asia, Morpo butterflies of South America and the Owl Moth, whose outer wings cleverly mimic an owl’s face, in contrast to its’ iridescent turquoise inner wings, as it swoops to feed on banana plant leaves. Biodiversity in all its aspects is the topic of wall text and displays in Bugs, housed in a well-designed, high ceilinged building allowing plenty of natural lighting to infiltrate its layers. A veritable army of Leaf Cutter Ants was at work bringing amazingly large pieces of leaf from a plant in a clear cube, up, along a maze of rope and down through similarly exposing enclosures enabling us to follow their two way traffic to and from their lair below, where they’d already amassed an impressive amount of foliage into a green carpet. There was no covering around the ants as they made their way up and down their long, snaking rope and many of the children watching them were as amazed as we were by their strength. In Bugs we also watched as a zoo worker brought a huge hissing coach-roach out for the children (many quickly lined up for the privilege) to stroke; I was not among them! Illustrations on the wall there displayed the ‘5 Kingdoms of Life’: bacteria, plants, fungus, animals and protists. From this visit, we also learned that there are over 30,000 species of spiders, making them one of the largest animal groups. One of the most charming and informative places in ZSL London Zoo is without doubt, the Blackburn Pavilion, with its’ free strolling and flying small birds of every conceivable colour. It is not without its’ whimsical moments, as the birds whistle and preen, glancing sidelong at you as they do so. But the Pavilion also offers opportunities for education, such as this statement, appearing as a proclamation along one wall, ‘Today human activities have caused species extinction to rise 100 times faster shown in fossil records.’ A visible example of this is the Socorro Dove, which no longer appears in its’ natural habit in the wild. As Necked Stilts gracefully stepped around them, fragile, inquisitive baby birds hovered near to their mothers. A likeness of Charles Darwin, author of the originally controversial, evolution establishing tome ‘Origin of the Species’ is displayed here, among images of other men of science and discovery. 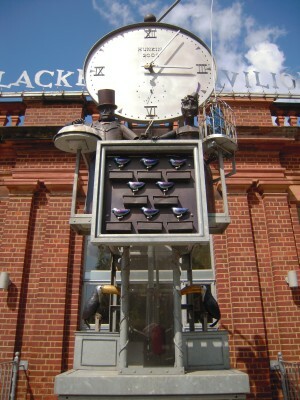 Standing tall outside of Blackburn Pavilion is the well crafted Hunkin Clock, (2008) apparently poor on time-keeping, but tops in entertainment value, with its’ tin man and woman, birds, and fish, all of which move into comic motion when the hour is struck! We enjoyed the flying, nodding, vanishing, re-appearing, re-arranging and overall organised chaos of the clock’s figures when the it struck the hour, among a small crowd of similarly happy zoo goers. Nearby is the child friendly Animal Adventure section of the zoo with its’ many nooks and crannies designed to enable childish imaginations and encourage physical activities like climbing, crawling and other enjoyable forms of play. Many happy children were making good use of the excellent options on offer as we passed. Big cats are always near the top of my must see list, as they are on those of many others, but the two sleeping tigers we spied, sprawled out over strewn hay in their space assumed a poignancy when one considered the fact that there are now less than 3,200 tigers in the wild, and man is responsible for their rapidly declining numbers which have fallen by 95% over the past decade alone! I used to think keeping animals in cages or nowadays, in habitats recreating their home turfs as closely as possible, was cruel, but knowing how they tend to be treated in the wild by poachers and the like has made me more aware of the vital role caring organisations like ZSL London Zoo play in animal conservation (in eighty countries) around the globe. It’s of vital importance that we all become more aware of which animals are endangered and support ZSL London Zoo in the very necessary work they do. A male and female lion, majestically resting astride a high mound, similarly made one think and wonder how much longer such impressive and beloved animals will be part of our world, and that of future generations. We happened upon these big cats as they were enjoying their post meal cat-naps! On our way back to the Rainforest house near the main gate, as we passed woolly llamas and plush hogs engrossed in their feed, we were fortunate enough to come upon a bird of prey demonstration, already in progress, just as a kestrel was being put through her paces. As the graceful bird swooped down for her prey, in this case, a small treat from one of her trainers, the crowd applauded, then ooohed and aaahed as the kestrel flew low, in a circle, directly over our heads. After the show, the bird was brought round, close to the crowd on her trainer’s arm, but we didn’t stay as there was so much we’d yet to see and so little time in which to see it! Grade II listed Casson Building (1965) originally built for elephants and rhinos, now houses armadillos, camels and the like, and we saw four nonchalant ‘ships of the desert’ unblinkingly chewing on what looked like straw as we passed them, but it was hard to tell whether their big dark eyes were looking at us or simply staring in our direction. As we passed the African Birds, we noted that the African Teal is now so rare in the wild, that captive breeding may be its’ only hope of surviving as a species. Yet another good reason to support ZSL London Zoo! Gorillas are among the most popular and powerful of all animals, but as we approached them, their broad backs were to us, as they were being fed cabbage leaves and carrots from the pail of a zoo worker, from whom they sometimes took their food directly, with their big powerful hands. There are four gorillas at London Zoo, three females of varying ages, and one large silver-backed male, though it is hoped there will be more in the not too distant future. Rainforest Life with its’ leafy, natural looking habitat - London's only living rainforest, allows birds and small animals to move freely through its’ high, open spaces, eating at will from coconut shell feeders and its’ companion section - Nightlife with its’ darkened, subterranean environment are both essential zoo visit stops. As you move down the stairs from the warm humidity of one section to the murky darkness of the other, you are able to view Rainforest Life through windows on various levels as you descend. Seeing bats furiously flying through what looked like a real cave, albeit a small one, in the Nightlife section was especially exciting. Small white, blind fish swimming through a tank with rocky looking sides have lost their eyes through evolution, as they no longer need them in their perpetually darkened world. 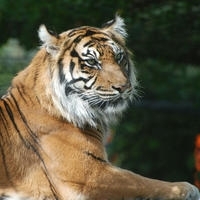 Although it is always a stimulating experience visiting ZSL London Zoo, there is a serious side to taking an interest in what the Zoo is doing, especially as it relates to animal conservation. Which, is as urgent a cause as imaginable, especially given this chilling statistic – due to the effects of climate change, 40% of Macaroni Penguins have now vanished from the earth! Another thing we learned is that there is so much on offer at ZSL London Zoo that it is impossible to take it all in, in just one day - a fact which confirms that a membership, enabling you to visit the zoo as often as you like, and support their vital conservation work at the same time is in order. With late night Fridays in June and July with their novel and fun silent discos (so as not to disturb the animals) just getting underway, there’s no better time than NOW to join.